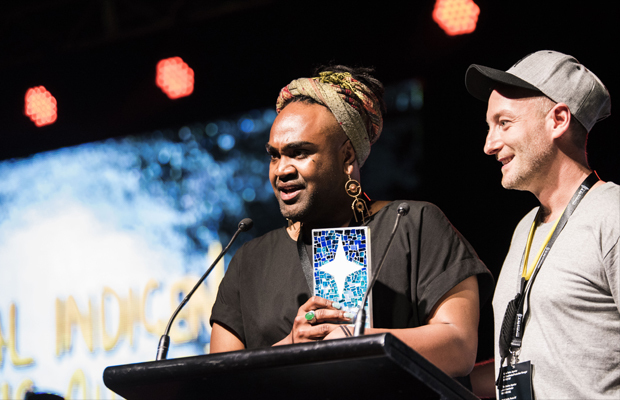 The annual National Indigenous Music Awards was a bittersweet event this year, both celebrating established and rising Indigenous talent and mourning the passing of a true Indigenous musical legend and icon. Amongst the presentation of awards were powerful live performances from artists from across the country, each to a rapturous reception. 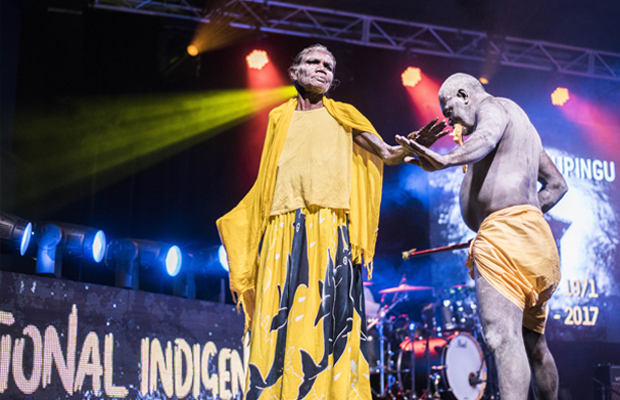 Pride and grief were in equal measure this year however, with the passing of Dr. G Yunupingu – an emotional and fitting tribute by family members and artists during the event went a long way towards helping people to heal. 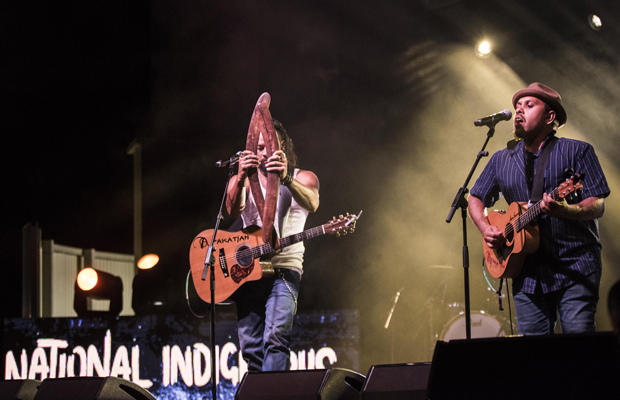 The performances were truly outstanding, with Triple J Unearthed winner Baker Boy opening things with a bang – the sheer physicality of his performance leaving our photographer running to catch up. An absolutely jaw-dropping performance from newcomers and New Talent of the Year winner Electric Fields set the Amphitheatre abuzz, both in front of the stage and backstage – this duo are a truly charismatic act. More sublime but no less enthralling were songstresses Emily Wurramara and Darwin legend Leah Flanagan, while Alice Springs virtuosos Apakatjah brought their wonderful mix of Indigenous voice and flamenco-style guitar. 2016 NIMA winner Gawurra once again graced the NIMA stage with his soulful songs and the visually spellbinding Numbulwar Red Flag Dancers filled the stage with colour. AB Original (with Dan Sultan and Darwin’s Caiti Baker) got the place bouncing with special guest Paul Kelly, who also gave a solo performance. As mentioned, the tribute to the late Dr. G served to both remember the much loved artist and to celebrate his life and his work. 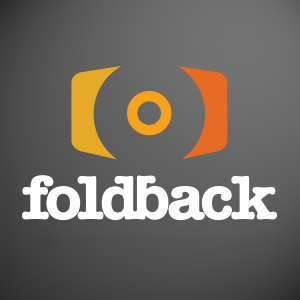 Foldback Magazine was honoured to once again be part of the NIMAs and Darwin Festival and we look forward to NIMA 2018.